(L) Vintage Mens 70s Disco Shirt! Modern Art Modigliani Portraits! 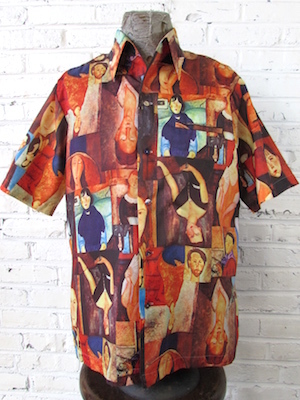 Home > Men's Vintage Shirts > All Men's Vintage Shirts > (L) Vintage Mens 70s Disco Shirt! Modern Art Modigliani Portraits! Mens vintage 1970s disco shirt. 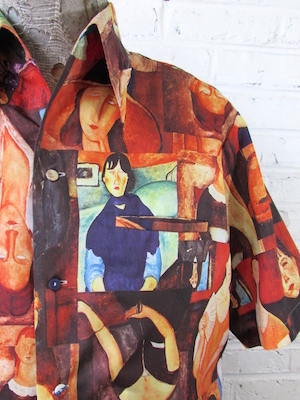 This amazing disco shirt is covered in gorgeous modern art portraits by Italian painter Amedeo Modigliani. Since this shirt is composed of paintings, it has an extensive palette of colors including rich reds and oranges, ochre, brown, bright blue and rich umber browns. Has a super wide & pointy disco era collar. Closes in the front with square, pearly white buttons with two matching buttons on each cuff. Shirt has a straight hem. Tagged by Rags. Acetate/Nylon blend . Condition: Very Good. Has two pin sized brown stains near the left side of the placket. Still an amazing disco era shirt!